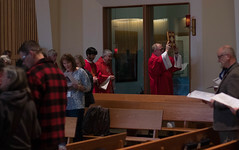 Every year the priests of the Diocese of Juneau gather in the capital city for the Chrism Mass to renew their promise to serve the people of the diocese and to receive the three oils, blessed by the bishop, that will be administered throughout the year. This year was different for the diocese, as the Bishop’s chair is currently vacant. 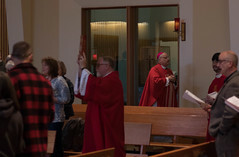 However, it created the opportunity for Archbishop Paul D. Etienne of the Archdiocese of Anchorage to make his first visit to Southeast Alaska as Archbishop. The Archbishop then returned to the example of being sick with the chills and how your hand or feet are the last things that get warm “to get that blood pumped out to the peripheries…in essence it’s a matter of the heart working well enough to pump that blood out” to the outlying areas of the body. He then explained that the heart of the Church needs to be renewed and to go out to the peripheries and reach out to those who don’t know love.